Summary: Jena, Dakota, Skye, and Owen are all at Paradise—the resort in the Caribbean, that is—for different reasons, but in Paradise their lives become tangled together in ways none of them can predict. Over the course of four months, through four voices and four stories, what happened in Paradise will change them all. In this extraordinary novel, the Printz Honor–winning author brings us her most accomplished work yet. 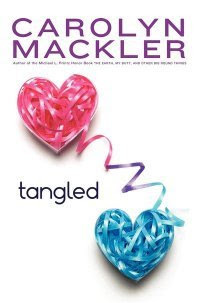 Tangled is a story of the secrets we keep, the risks we take, and the things we do for love. My Thoughts: Tangled was a story about 4 teenagers whose lives were intertwined. The book was divided into four sections where it gave us a view of what it was like to be in each person's shoes and what they were thinking. We started off with Jena, went to Dakota, than Skye, than Owen. I took an instant liking to Jena. I wasn't too fond of Dakota, I know he had been through a lot but he came off as kind of a jerk and he shouldn't have treated Jena the way he had no matter what had happened in his own life. Than, we have Skye, who at first think the world revolves around her, but we find out her deep dark secrets soon after. I liked Owen from the start, he just seemed "normal." I did like finding out what each of the characters were thinking.I want to feel like I was in their head. The one thing I did love love about the book was it referred to Nicholas Sparks a lot (my favorite author)!! Overall: This was a good book and I enjoyed it. Normally, I don't like books told in each person's perspective so that may have been my biggest problem. But it came together in this one. It wasn't hard to follow whose point of view we were reading about. Overall, it is worth a read! Cover: I really really like the cover. It was the first thing I noticed about the book and it drew me in. It is really pretty even though in reality it is plain. But the hearts and the colors just work and made me curious on what it was about. Love Love the cover!!!! this sounds super cool - seeing the story from 4 different points of view like that. Sounds all tangled up. I'm intrigued. I've been wanting to read this one for awhile now. I love the cover as well. The subject of more than wonderful. I don't really care for books told in multiple perspectives usually but this does sound neat. I just love that cover!